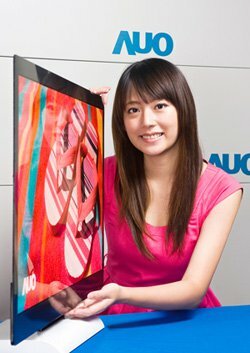 AUO announced it will show several OLED prototypes at the FPD International 2011 exhibition later this week. The company will show a new 32" Full-HD OLED TV prototype. This TV uses a Metal Oxide TFT as backplane and is only 3mm thick. AUO says that the TV has a quick response time and high contrast ratio. Hopefully the company will unveil the specifications and commercialization plans during the conference. AUO will also show a 4" Flexible AMOLED panel (which is based on Low Temperature Processed Metal Oxide TFT as backplane driver). This panel is only 0.3mm thick. AUO will also show other prototypes such as a 65" transparent LCD, 65" gesture-controlled 3D LCD TV, super-narrow bezel LCD panels and 6” Rollable Organic TFT E-paper. Just a few days ago the company unveiled a new 4.3" AMOLED panel offering 257ppi, which will launch soon (probably in early 2012). They also demonstrated a 6" transparent OLED display (with a transparency rate of over 35%), and a 4" Touch AMOLED display that features 30% less energy consumption compared to other AMOLED. Nice! I'd like to see 21:9 models show up in 100". Go, do it quick! just get an affordable 22" display for my computer... don't need the huge size but great response time and high contrast? yes, PLEASE! been waiting for these displays to be released for five years or something already! VERY NICE WORK: STRUGGLING FOR THE FUTURE GENERATION. PLEASE CONSIDER THE ENVIRONMENT AND HUMAN HEALTH. WHAT ABOUT THE GLAIR EFFECT ON HUMAN EYES?